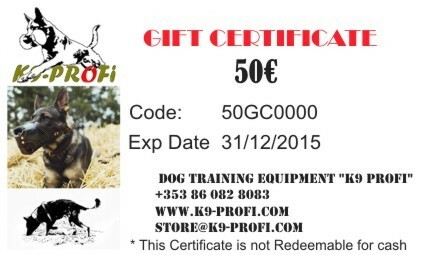 Gift certificates from K9-Profi.com are just the right present for any occasion! Just choose the amount you would like to spend for your special gift. It's not easy to find the right present for friends, relatives or colleagues! For all animal lovers we now have the perfect solution: the k9-profi.com gift certificate. Avoid forfeiture! Only one gift certificate may be used per order. Make sure you choose an amount which the receiver will be able to use up in one go. Surplus gift certificate credit will be lost. So if you're not sure what the receiver of your gift certificate would like to buy, go for two certificates for €50 each rather than one for €100. Please note that gift certificates will only be sent once payment has been received. By email or print-out? We will send the gift certificate by email to the address you give us. If you would prefer to give your gift in person, just have it sent to your own email address - you can then print and give the gift certificate yourself. Be sure! You will automatically receive a confirmation email when the gift certificate has been sent. So you will know that your gift has been received on time. Indicate issue date for a gift voucher, if required.